The Local Conversation in Holyhead is supported by Mon CF and funded by People’s Health Trust. The programme is a flexible, resident-led funding model driven by what local people want. Through the programme, residents are supported to identify and take action on issues that are important to them. In this blog, we hear from Dan Roberts, a resident who joined the Cybi Events group in 2017. 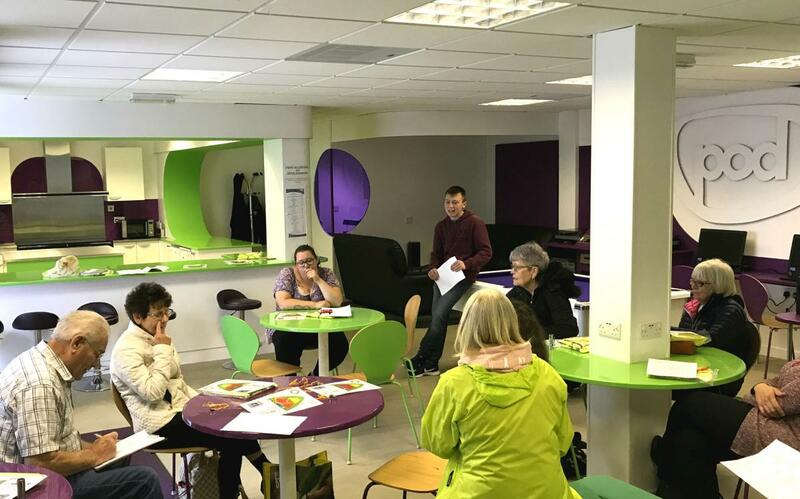 The group was set up to focus on the Local Conversation’s priorities: to encourage residents to plan and run community events, support young people to design activities for themselves and to support residents to access training and employment opportunities. Dan said: “The main reason I decided to join the group was because they genuinely wanted the voice of younger residents within our community. A year on and I have learnt several skills which include the boosting of my confidence organisational and social skills. Before I became involved, I was a fairly shy teenager that thought my opinion was irrelevant in multiple aspects of my life. This group didn’t only help the community come together but helped me become who I truly wanted to be. I would even go as far as saying that the group has shaped me and my future. As a teenager you are pushed to decide upon your future and education very suddenly and I had a wide variety of career options that I jumped from. Working with the group and building my skills, I finally settled on business marketing as the group showed me that is what I am most passionate about. Leading up to an Annual General Meeting (AGM) I was contemplating whether to put myself forward for one of the leading positions which would help improve my skills to an advanced level. I had visions for the group and its progress after the amazing first year. However, local people still didn’t know who we were or where to find us. As it was a community group, I wanted the community to be a large part of the decisions we made and give others the amazing chance I had back in 2017. When the AGM came around, I put myself forward for the Chair position and was backed by the whole group. This was scary to begin with, I felt that I had the power of changing my community which could have been a lot of work. However, the committee was and is united with the support of the wider group also. So, it was time to put these visions for the group and the community in place. The main thing that I thought we were lacking was identity within the town and so we built our reputation. This included a new name, logo, social media presence, website, contact details and general theme. This would allow the community to understand who we are and our aims for the future. It would also give local people access to information on upcoming and previous events and finally it would provide a place for residents to have their say and have the chance to join the group. The events that took place within the first year were outstanding, bringing people out of their houses and socialising with residents, groups, clubs, and businesses. It was truly phenomenal how an event could have the power to do such a thing. On a more personal note, this group has helped me in social aspects regarding self-confidence and understanding, employment prospects regarding training and skills development that enabled me to secure a part-time job and educationally/my future. Find out more about the Local Conversation in Holyhead.